Tag Archives: Harvey Mason Jr.
One of the challenges of today’s more limited space in print media is condensing sometimes lengthy, comprehensive interviews down to their very essence. Yet it’s always fun to talk with major musical artists about working in film, which generally involves more specific parameters than just writing or arranging a song for a record. So for a story in this week’s special issue of Variety, I had to take 20- or 30-minute interviews with Justin Timberlake, Lin-Manuel Miranda, Harvey Mason Jr., French singer Camille and Disney songwriter Glenn Slater and find a way to assemble their key thoughts into one coherent story. 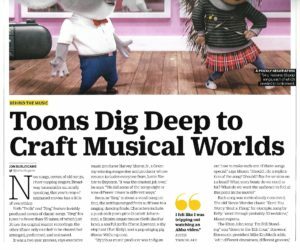 They talk about the current films Sing, Trolls and Moana, plus earlier 2016 films including The Little Prince and Sausage Party. This entry was posted in Composers, Film Music, Interviews and tagged Camille, Glenn Slater, Harvey Mason Jr., Justin Timberlake, Lin-Manuel Miranda, Mike Knobloch, Moana, Sausage Party, Sing, The Little Prince, Trolls, Variety on January 7, 2017 by Jon Burlingame.